Popular Daybreak Model, This Home features an open Great Room floor plan w/split Bedrooms plus a Private Den. Great Room, Kitchen, and Master have Beautiful Premium Tile Flooring. The Kitchen boasts Lovely Cabinets w/ pull-out shelves,a pantry, built-in Microwave, Gas Stove,all appliances are newer and are included. Large Dining area with Bay Window. Ceiling fans, Recessed Lighting, Shutters, Surround Sound, Wired Throughout with Ethernet. Master Bedroom with Bay Window, Master Bath has his and her sinks and a step in Shower. Laundry has a Utility Sink, Built in Desk, Extra Cabinets and a Gas Dryer. Back yard features a Full Covered Patio, with Extended Brick work, BBQ Island with Gas Grill, raised Planter, and a Private Yard. Garage is Extended, with Cabinets, Work Bench, Service Door. 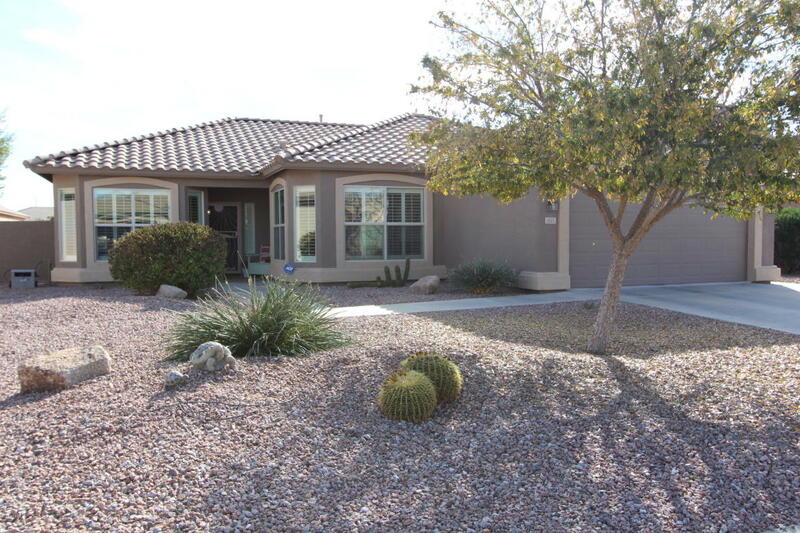 This Home's Location is in the heart of the Community and has been very well maintained!